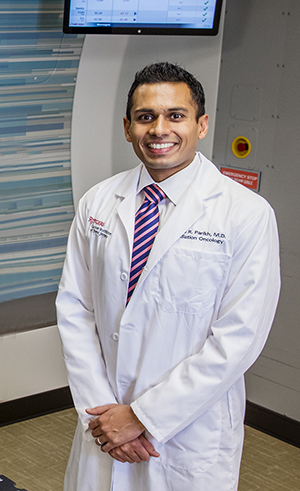 Radiation oncology specialists at Rutgers Cancer Institute of New Jersey and the Laurie Proton Therapy Center at Robert Wood Johnson University Hospital are excited to offer an advanced kind of radiation treatment called proton therapy, or proton beam therapy. Proton therapy is a type of radiation therapy treatment that uses protons, equivalent to positively charged hydrogen nuclei, to target a tumor in a very precise way. Unlike conventional x-ray (or photon) therapy, proton beams have the unique property of stopping at a certain depth in tissue. This special property of proton beams can be put to use and controlled to focus on a specific area of target in the treatment of cancer patients. Proton therapy is the latest addition to the wide variety of comprehensive radiotherapy services that are available to patients at the Robert Wood Johnson University Hospital and Rutgers Cancer Institute of New Jersey. Please contact us at 732-253-3939 to learn more about proton therapy or other kinds of radiation treatment for cancer.